Despite all of the benefits of smart satellite receivers like Dreambox, there are still a lot of dumb Free-To-Air ones. They are cheap, simple and often sufficient for casual TV couch potatoes. Still, they all have to be updated from time to time, as channels move from frequency to frequency, new channels appear, some old disappear, or even completely new satellites are launched. It is easy with Dreambox and such, as they can be hooked up to a personal computer and they can read data from standard files. Not so with the majority of dumb receivers. Although they too can be hooked to a PC, the interaction occurs only through pretty basic channel list editor. Those editors know nothing about importing foreign data, so we are expected to enter each and every bit manually! Programming by itself is not too difficult, only three parameters are involved: frequency, polarization and symbol rate (collectively called transponder), the only problem being that they have to be entered hundreds of times. Usually, the ready prepared lists are used whenever available, but what to do when such a list is not available, not to our preferences, or is very outdated? Being often in a situation of having to program those dumb receivers, I have devised a way of simplifying it as much as possible. The standard channel list editor is inevitably used, but entering the parameters from readily available sources is automated. What follows is not a beginner's guide to programming STBs. You'll have to learn the basics elsewhere. Once you do, you will appreciate the level of automation achieved. That is the beginning of section concernig the Hot Bird satellite on position 13E (section name ). Only the first five transponders are shown here. There are 101 transponders in total on that satellite (key 0 of the section). The fourth parameter of each line (56 or 34) is irrelevant, your *.ini file is fine if it is without it. Automation is achieved with the help of AutoHotkey interpreter for Microsoft Windows. It runs my scripts that will read the transponders from the mentioned *.ini file, and enter them into channel list editor as if it was all done by hand, only much faster and 100% correctly. Edit the script, enter the section name of the related satellite from the *.ini file. Run the script, don't touch the keyboard or the mouse until the script has finished! As mentioned in the step four, the existing transponders have to be deleted first. Sometimes, the easiest way is to delete the whole satellite from the list and create a new one. In other cases, transponders have to be deleted one by one, each one confirmed. For the latter case, I have provided two scripts that confirm automatically, one is for the case when the default confirm option is Yes, the other for No. The delete script sits in the system tray, and it converts each press on the key d to delete+confirm. Don't forget to exit the script when done deleting (right click on icon, Exit). I have prepared and tested the custom scripts for the four editors I have used to program STBs. If you recognize your editor below, you are lucky, the script waits for you. Otherwise, some effort will be required to understand what's going on and how to adapt the script to serve your editor. Enter one transponder by hand and write down the steps needed. Then study the AutoHotkey help and see how to send the same commands by script. I suggest you cut your *.ini file to just a few transponders until you make sure that all goes well. The script is pretty simple and well commented, it should be easy to modify. Here are the four tested editors, and steps needed to prepare the ground before the script can be run. is used to program Infinity receivers. The script will fill the transponders for the first satellite in the list (HotBird in this case), so it has to be visible (field A, expand the list). To clear the old transponders, delete the satellite, and then create a new one with the same name. To move a satellite to the first position, right click on it and choose Move Up. for the famous DigitAll World receivers. Load an existing list or download it from the receiver. 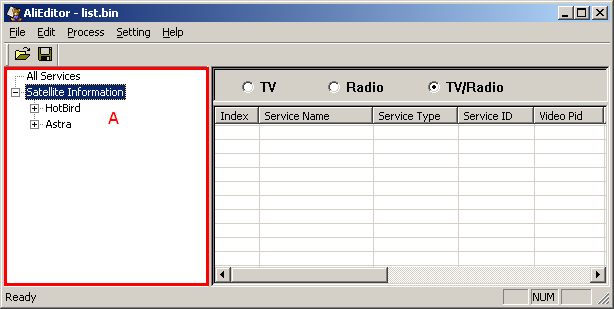 Select the satellite in the field A. Delete all the corresponding transponders in filed B. Use the delete_default_yes.ahk script to speed up clearing. YU-MA-TU, Truman and compatibles. First select the Transponder tab A, then choose the wanted satellite in B. Delete all the old transponders in C with the delete_default_no.ahk script. is the most versatile list editor of all. It covers hundreds of STB models. Select the satellite in the field A. Use delete_default_no.ahk to clear the transponders list B. Then run the script. As usual, any tool can be both life-saver and death-threat at the same time. Use at your own risk! Especially the two delete scripts could be dangerous, as they will remap the letter d into delete+enter in any program currently active! They are there to help you, it is your responsibility to use them wisely. Also, there is no warranty that the scripts will do what they claim, although they have been tested and proven to be very useful. There is no warranty whatsoever! This is very informative and an eye opener but can the editors be use in programming others receivers e.g strong receivers? I really need strong receivers editor!